If you ever suspected the Richard Linklater “Before” trilogy would be better with less talking and more psycho-killers, than here’s’ the proof you have been waiting for. A scuffling British slacker and an attractive French hitchhiker decide to tag along together, because maybe they are sort of interested in each other. They can also watch each other’s backs, since a serial killer has been preying on hitchhikers and the motorists who stop for them along the quiet highways of the rural Northern provinces. However, things really get awkward when a strange older couple take them in for the night in Abner Pastoll’s Road Games (trailer here), which opens this Friday in New York at the IFC Center. Jack has had a hard time of it in France, losing pretty much everything but his passport and the clothes on his back. Véronique is not having much fun either, especially when the driver who picked her up stops to get fresh (or foul). Fortunately, Jack happened along in time to intervene. As a result, Véronique feels safe enough to join forces with him. Rather inconveniently, the recent rash of roadside killing (of which the British Jack is blissfully unaware) have made most motorists understandably reluctant to pick up hitchers. Apparently Bruno Grizard is an exception. Grizard generates all kinds of suspicious vibrations, especially when he stops to grab the rabbit he just crushed, to turn it into stew. The talkative driver invites them to spend the night as guests in his large manor house. His American wife will be delighted he assures them. Jack couldn’t leave for Britain until morning anyway, because a strike has been called for the docks of Calais. That sounds a little fishy to the Brit, but this is France, so you never know. Mary Grizard is most definitely high-strung, but she seems to take a liking to Jack. Nevertheless, the already strained atmosphere gets even tenser as the night goes on. It is pretty safe to assume the serial killer is in the house, but Pastoll will engage in all kinds of misdirection to keep us barking up the wrong tree. 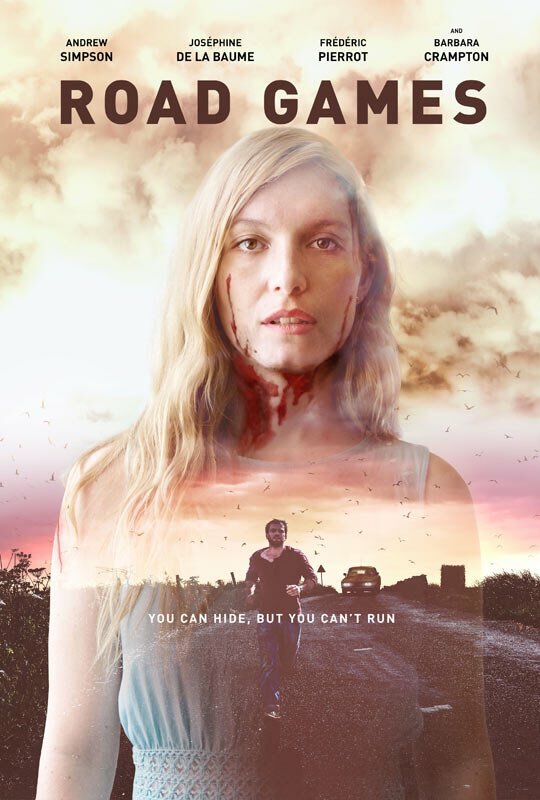 Although Road Game has played a few high profile horror festivals, it is really more of a Hitchcockian suspense film, but that is a much trickier vibe to pull-off. Yet, Pastoll manages it quite adroitly. French and English bilingual fluency might actually sabotage the enjoyment of this film, because miscommunication and mistranslation are slyly employed to keep certain characters and the audience in the dark. The cast is also first-rate starting with the legendary Barbara Crampton, who seems to be having a second career renaissance with films like We Are Still Here and You’re Next. She is perfectly elegant and agitated, yet also rather sultry. Essentially, it is Andrew Simpson’s job to be rather vanilla as Jack, but Joséphine de La Baume’s Véronique has some sort of femme fatale thing going on that definitely heats up the screen. Likewise, as Grizard, Frédéric Pierrot is not exactly shy when it comes to chewing the scenery (nor would we want him to be bashful in a genre film such as this). Even though there is a considerable amount of sunlight in Road Games, Pastoll and cinematographer Eben Bolter still give it a sinister, almost Giallo-worthy look. There is no question Pastoll plays us, but he does it well, so it is hard to resent him for it. In fact, it is really quite a lot of fun. Highly recommended for fans of serial killer movies and psychological suspense, Road Games opens tomorrow (3/4) at the IFC Center.